Harbison genealogy: William Harbison (1782-1868). Part II: the real estate. William Harbison (1782-1868). Part II: the real estate. William is listed in Slater's Directory of Ulster (1846) as a grocer,wine and spirit merchant. Selling liquor seems to be a family tradition. These are his real-estate holdings, listed in Griffith's Valuation of 1858, Ireland's first systematic government valuation of real property. 46 acres and £42.25 valuation may not sound like much, but they mark him as a fairly wealthy man for the time and place; at least middle-class. Griffith's does not let one easily identify the house numbers. 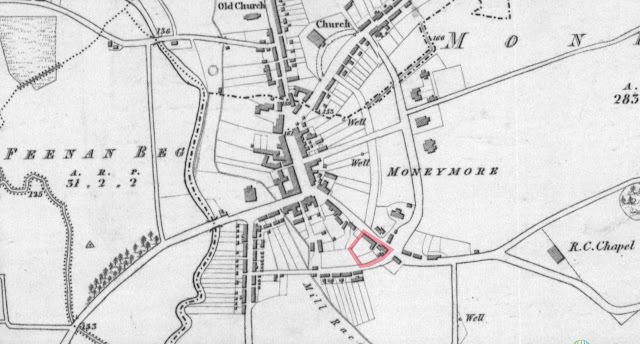 However, it seems pretty clear the Conyngham St. property was the one shown in the 1832-1846 Ordinance Survey map; nothing else fits the description. Note everything is leasehold; the Worshipful Company of Drapers and the Church of Ireland owned everything, back in the days before land reform. We can get a broader look at the real estate using the Griffith valuation map. Coltrim lot 6 is towards the bottom left, adjacent to Crossnarea 9. Crossnarea 10 is closer to Moneymore, and Ballygruby 7 is near the top, to the right of center.